I am a designer that likes fresh ideas all the time. That doesn't mean I want to reinvent just to be different. I love classic peices that evolve, evoke and surprise! 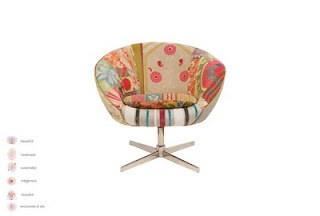 This chair from ABC Home is just what I look for to add that something perfect. It's whimsical, textural, delicate, functional and yes, timeless. Frankly, it makes me want to travel to Uzbekistan and see where this fabric is made.